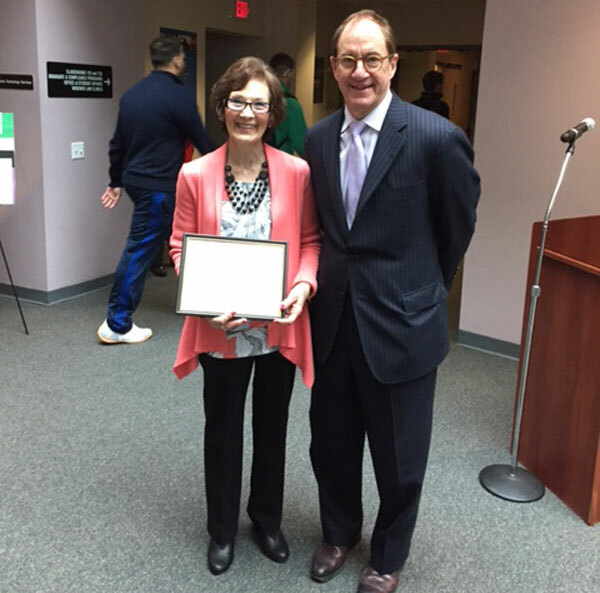 Congratulations to Denise Manelski, the recipient of the Employee Appreciation Award for the spring 2016 semester. Denise has provided exemplary service to Widener University for 30 years spending the last 18 in the Legal Education Institute where she helps guide students through the admissions process and into graduation. She is an incredible asset to the law center and is helpful, responsive and extremely student oriented. Faculty and co-workers know Denise will be present each day with a smile and a great attitude. Denise is a member of a very loving family and enjoys spending time with her husband and grandchildren. Picture: Dean Rodney Smolla presents the Employee Appreciation Award to Denise Manelski.